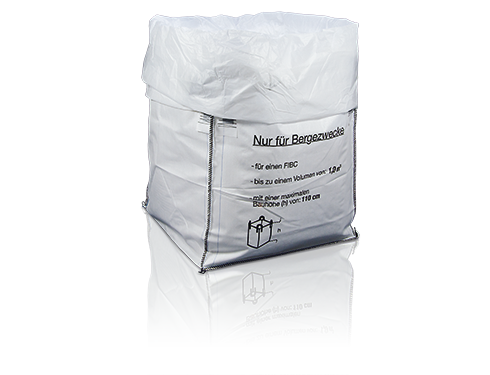 Strong repackaging for critical goods whose packaging does not enable secure transportation: rescue containers have been approved by the Federal Institute for Materials Research and Testing (BAM) for weights of up to 1,500 kilogrammes, 13H4W. One flexible intermediate bulk container (FIBC) can be packaged and transported with absolute security in each rescue container. Available from the Emsdetten storage facility. Repackaging/transport packaging for damaged FIBCs. Repackaging/transport packaging for FIBCs without specific UN approval which have been filled with hazardous materials.